Successfully Added JYO180 Mini Drone - 2.4GHz WiFi Control, 720p HD Camera, 6 Axis Gyro, App Control, 500mAh, 30m Range, FPV, 3D Flip Black to your Shopping Cart. Featuring the size of a smartphone, the JYO180 WiFi drone is a revolutionary Quad-Copter that is guaranteed to treat you to days’ worth of fun. This extremely compact pocket drone comes with foldable arms and weights less than 90 grams. Thanks to this, your mini drone is ultra-portable and can be easily carried along in your pocket anywhere you go. With its built-in 720p camera, this pocket drone is perfect for snapping selfies or shooting aerial footage of your surroundings. When synchronized with your phone, this video drone is easy to control. This makes the JYO180 the perfect toy for beginners and advanced drone pilots alike. With its 2.4GHz WiFi connectivity, this mini drone can be easily controlled via your iOs or Android phone. It furthermore supports FPV meaning that you’ll be able to experience a stunning first person pilot experience while cruising through the skies. With its compact 500mAh battery, your pocket drone delivers up to 8 minutes of continuous flying time. This is enough to explore your surroundings and shoot some stunning HD footage from above. Coming with a six-axis gyro, this mini drone lies stable in the air. Even those of you that fly a quad-copter for the first time will find this pocket drone easy to control. 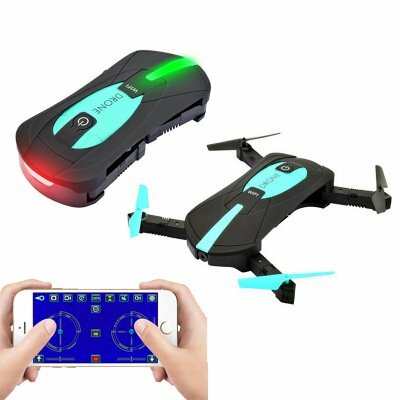 For the more experienced drone pilots among us, this cool electronic gadget supports 3D flips and other amazing features that will take your flight experience to the next level. This offers you a great way to impress your friends and people standing by. It furthermore has been crafted out of durable ABS material. Thanks to this, you won’t have to worry about accidentally breaking your drone while crashing into something. This means that you’ll be able to try out new tricks with confidence as nothing will stop this cool gizmo from working. If you’re looking for a cheap and fun way to entertain yourself and the kids, this RC drone is the perfect accessory for you. This JYO180 Quad-Copter comes with a 12 months warranty, brought to you by the leader in electronic devices as well as wholesale electronic gadgets..
Arabic: - مصغرة بدون طيار - Chinese Simplified: - 微型无人驾驶飞机 - Czech: - Mini Dron - Danish: - Mini Drone - Dutch: - Mini Drone - French: - Mini Drone - German: - Mini-Drohne - Hebrew: - מזל"ט מיני - Hindi: - मिनी गबन - Italian: - Mini Drone - Japanese: - ミニ ローン - Korean: - 소형 무인 항공기 - Malay: - Mini berdengung - Norwegian Bokmål: - Mini Drone - Romanian: - Mini Drone - Russian: - Мини-БЛА - Spanish: - Mini robot - Thai: - เสียงพึมพำมินิ - Turkish: - Mini casus uçak - Vietnamese: - Mini Drone.